The Encore Select 127-02 Boston Celtics Legends Larry Bird Print is an exciting piece of sports history and is professionally prepared and ready-to-hang in your office, man cave or place of business. Make your friends and family jealous with this great piece of sports memorabilia. 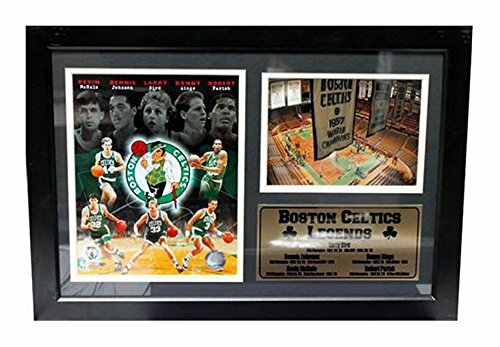 Larry Bird Team Boston Celtics 12x18 photo stat frame with statistic nameplate. This is a must have for all true Celtics fans. Encore Select offers a full line of products including baseballs, footballs, basketballs, jerseys and other hand-signed memorabilia. Every autographed item we sell comes with a certificate of authenticity with the Encore Select Official hologram. In addition to top athlete apparel, Encore also develops sports, political and themed merchandise. Encore offers a "full service" stop for all custom apparel, including logos and art design.